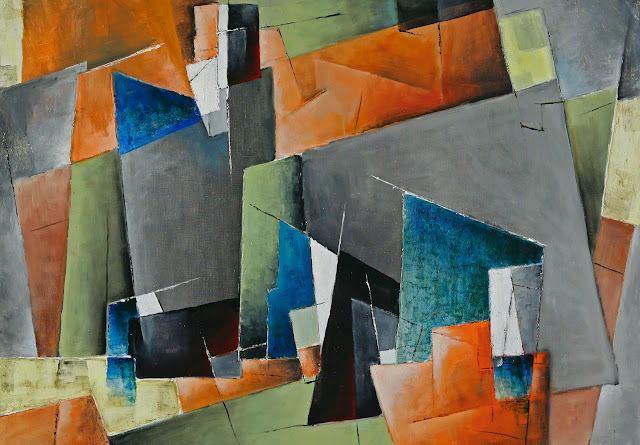 Fine Arts Center Blog: Rocky Mountain Modern Opening This Weekend! Charles Bunnell, New York, 1955. Oil on canvas, Collection of James and Virgina Moffett. 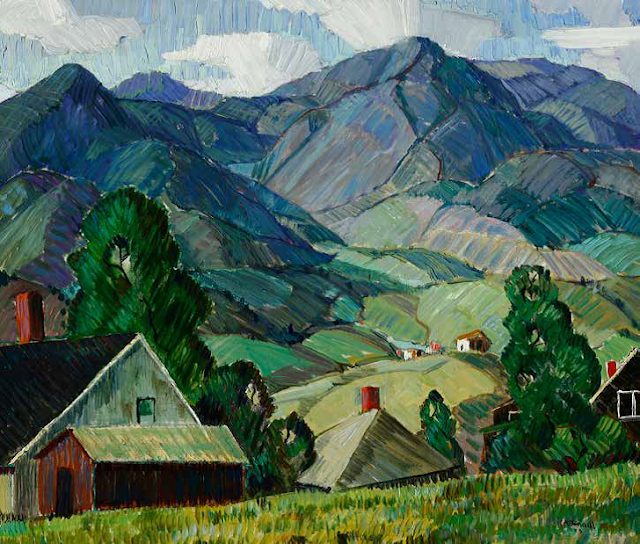 Opening to the public on Saturday, June 8, this expansive collection of Charles Bunnell's work showcases the revolutionary style of abstraction that Bunnell introduced to the Colorado landscape. An artist who lived and worked in Colorado Springs, Bunnell "was inspired to combine his deep love for the natural beauty of the landscape with an abiding passion for pushing experimental limits in creating his art." Charles attended the Broadmoor Art Academy throughout the 1920s, where he mastered the traditional techniques of painting. He was the first in the state to embrace purely abstract forms and modernism as he continued his career. Charles Bunnell, Constrasts, 1928. Oil on canvas. Collection of James and Virginia Moffett. 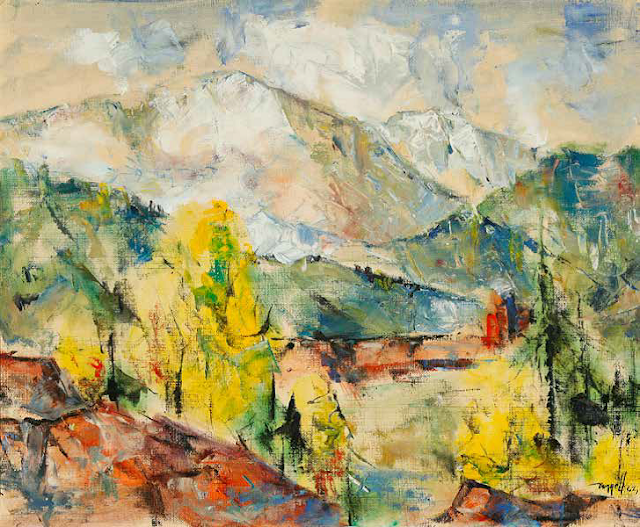 Charles Bunnell, Mountain Landscape, 1962. Oil on canvas board. Collection of James and Virginia Moffett. 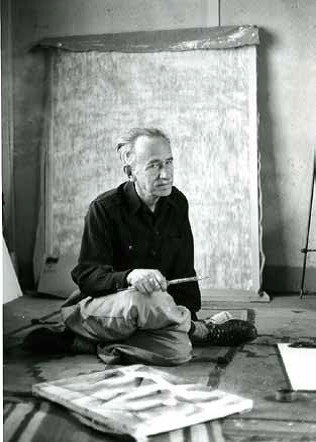 "In his mature works of those decades, Bunnell sought to articulate the urban vigor that had emerged in the work of Jackson Pollock, Barnett Newman, Willem de Kooning, Mark Rothko, Robert Motherwell and others, but his process and imagery was ultimately inseparable from his home between the jagged spires of Garden of the Gods and the soaring alpine summit of Pikes Peak"
Many of Bunnell works in Rocky Mountain Modern are generously loaned by the Moffett Family Collection. This exhibition showcases the transition from traditional landscape paintings to pure abstraction in Bunnell's work.